A pump track is a continuous loop of multilevel dirt that allows cyclists to generate speed without pedaling. The pump track derived its name from the pumping motion of the upper and lower body used by cyclists for balance while they bike on such a track! Why a Pump Track at PCEI? Besides being a fun activity that gets kids outdoors, riding a pump track is an excellent form of exercise that can be performed by anyone on any non-motorized bike. A pump track can be used recreationally, as cross training for other sports, or as a way for youngsters to increase bike-handling skills away from traffic. 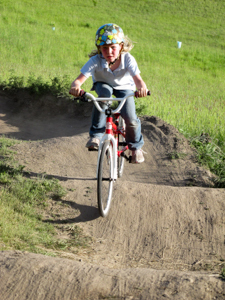 “The pump track provides a safe place for kids to ride their bikes and thus hopefully develop a lifelong riding habit,” says Jerry Long, PCEI Board member and member of Palouse Bicycling Racing. 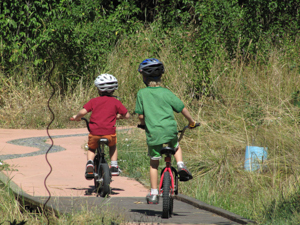 The PCEI Nature Center is also a great place to learn to ride a bike. Visitors can borrow one of our Bikes for Tikes and teach their kids to ride on our multi-use, accessible pathway. 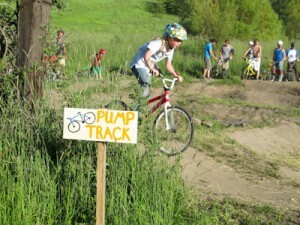 In 2012, we were approached by Palouse Bike Racing (PBR) about building a pump track at the PCEI Nature Center. Both PBR and PCEI promote bicycling as a healthy and lifelong activity, particularly for school-age children, however there are limited opportunities for recreational road biking within city limits. The PCEI Pump Track is the only public one in our area. The next closest public pump tracks in Idaho are in Boise and Ketchum, between 5 and 8 hours away. Volunteers committed to expanding biking experiences in our community put in nearly 500 hours of their time in 2013 to build the pump track. Donations were made to rent a bobcat to do the major earth moving and the rest of the shaping was done with hand tools. A local contractor was hired to do drainage work, but more work needs to be done for drainage and erosion control. The basic pump track we have now is already a valuable asset to our biking community. Improving the track in 2014 will allow for classes to continue to be taught through the City of Moscow Parks and Recreation Department. More kids will have access to Palouse Bicycle Racing, more community members will be taught about the value of outdoor experiences and Moscow’s children will have another safe place to play outside. Want to help improve the PCEI Pump Track? Donate today!